The eXplorist 400 comes with a rechargeable battery good for up to 14 hours of power. The expandable memory is another big plus when paired with topographic data downloaded from Magellan MapSend software. Marking waypoints is pretty easy with the eXplorist 400 – just press the “Mark” button to save your spot. The controls are identical to those on the other eXplorist models and they’re pretty easy to use. Fortunately the eXplorist 400 software for transferring GPS data to your computer is as easy as pluging it into your USB port and the GPS memory shows up as a removable drive. 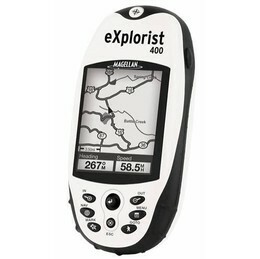 In my opinion the eXplorist 400 falls short in a few areas. First, the computer cable connection on the back of the eXplorist is pretty weird and involves lining up contact points and using your fingers to screw the connection in place. The battery compartment is also attached in the same way and you have to remove the Battery to reach the sd card. On the trails the satellite signal reception leaves a bit to be desired. To be fair the eXplorist 400 user manual does say “Point the antenna up toward the sky. Don’t Stand under trees or heavy foliage.” Avoiding trees or heavy foliage cover is kinda tough on most trails so this could be a significant problem for some depending on how your using it, but it’s certainly something to consider. Overall I think it’s a pretty good choice if your funds are limited or if it’s your first entry to using a GPS for outdoor activities like Geocaching, Hiking, Mountain biking, or for finding your way to your tree stand for hunting.